Friends of Henllys LNR held a bug hunt to make a start on an audit of the biodiversity on the Local Nature Reserve. On this perfect sunny day, ten of us grabbed bug hunt nets and viewing containers (kindly loaned to us from TCBC Countryside Section and Greenmeadow Community Farm) and sweep netted the meadow searching to see what invertebrates we may find. All the volunteers went out sweeping while Chris sat at his camping table waiting for all the nets to return so we could photograph what we found. Transfering the catch into the observation container was trickier than we imagined, as was photographing them afterwards. We were all amazingly suprised with the massive numbers of bugs that we did catch. You do often notice butterflies, bees and other large insects, but the variety in sizes and colours of bugs that we sampled impressed us all. It shows how valuable the meadow is for nature as well as for us. 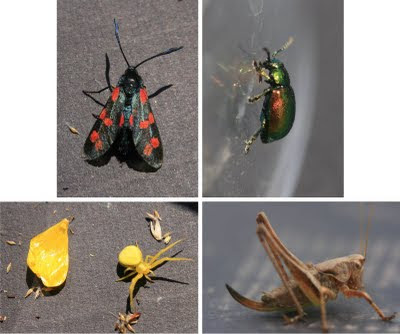 Dazzlers on the day included the striking 6-spot burnet moth (Top left), a green irredescent mint leaf beetle (Top right), a bright yellow crab spider (Bottom left) and the dark bush cricket with its almost fluorescent green/yellow underside (bottom right). The bug hunt, albeit great fun and informative as it was, gave us excellent relief from pulling himilayan balsam. However, it also showed us what we are here to protect and enhance. The large amount of seed collected in the nets reminded us that the meadow will be cut in a few weeks time and we will be looking for loads of help in September to rake it off to help further enhance the LNR. With all conservation management, if you get the building blocks of the plants right then everything else should fall into place. Friends of Henllys LNR is free to join, everyone is welcome and for more information call Chris Partridge on 07717 412 270.